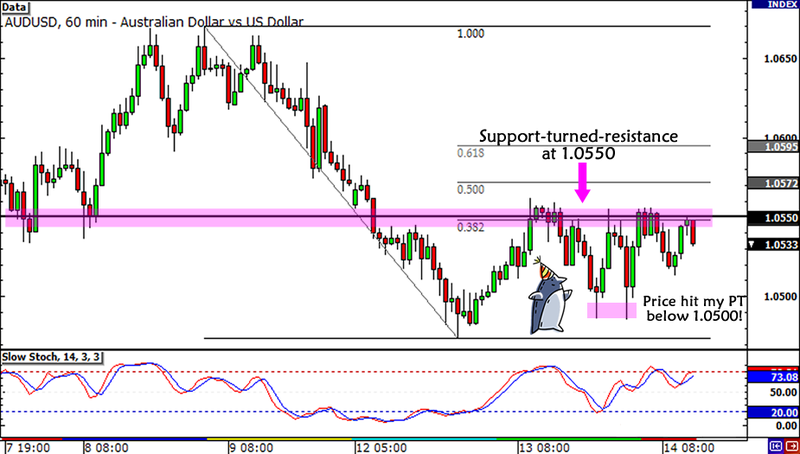 Day Trade: Jumping on AUD/USD’s Retracement – PT Hit! Whew! Talk about grabbing some quick pips for a day trade! Thank goodness I decided to pull the trigger on this AUD/USD short just when the technical and fundamental signals lined up. But, as promised, I was going to lock in whatever profits I had prior to the FOMC statement. 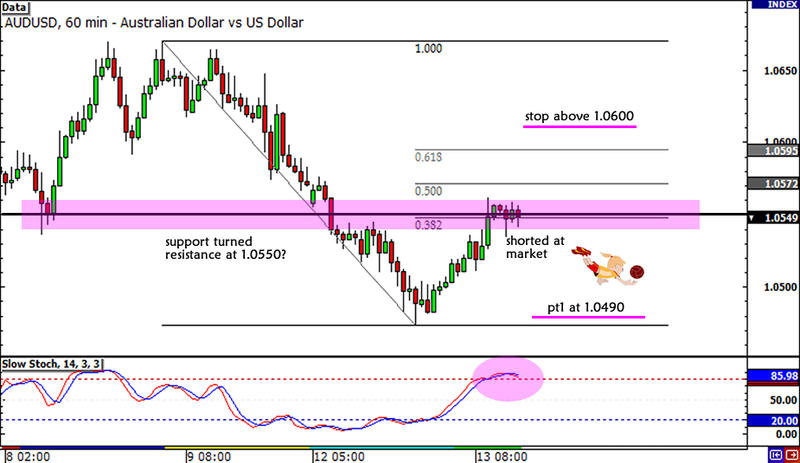 When I checked the charts however, I noticed that AUD/USD already dipped to my profit target just below 1.0500. As it turns out, the pair moved sideways during and after the FOMC statement, confirming that my target was just right for a day trade. Not too shabby for a day trade, huh? Plus, I’m feeling giddy that my winning streak continues despite that cancelled AUD/USD trade from last week! Do you think I should go for another trade this week or should I take it easy from now? You know how to reach me! When the signals are lining up as they’re doing on AUD/USD right now, a trader has to take advantage! Since I missed the short AUD/USD train last week, I decided to take advantage of the signals that are lining up on AUD/USD’s chart right now. For one thing, the pair is currently sitting on the 38.2% Fib near the 1.0550 minor psychological handle. Not only that, I’m also seeing a bearish divergence on the 1-hour chart just when Stochastic is showing signs of reversing from the overbought region! Heck, even Australia’s fundamentals are telling me to go short. China’s surprisingly weaker-than-expected GDP forecasts and trade balance data spell trouble for the Australian economy since China is Australia’s largest trading partner. Of course, it doesn’t help the Aussie that its economic reports have been disappointing expectations lately. Last week we saw weak GDP, employment, and trade balance data, which were followed up by a worse-than-expected home loans and NAB business confidence data a couple of hours earlier. Short AUD/USD at market (1.0546), put a 60-pip stop above the WO, DATR, 1.0600, and yesterday’s high, and aim for the previous low below 1.0500. I’m planning to keep this trade open until it reaches my profit target, but I have to close it before the FOMC statement so I can avoid any crazy spike. What do you think? Is this a solid trade idea, or could I still make any changes with it? Hit me up if you have any suggestions!